UPDATED: Wed., June 27, 2018, 10:59 p.m.
Hans Crouse isn’t your typical flame-throwing bonus baby. While Crouse throws in the mid-to-upper 90s, he also exhibits a series of shimmies, shakes and wiggles while atop the mound in mid-delivery. On Wednesday, in his first home start of the season, he was also quite effective when he eventually released the ball. 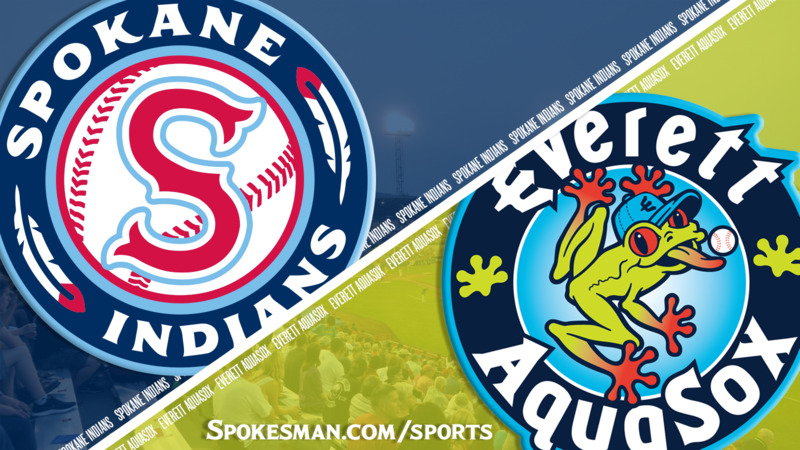 Crouse allowed just two hits and two walks with six strikeouts over five shutout innings and the Spokane Indians won their fourth in a row, topping the Everett AquaSox 5-2 in the second of a three-game Northwest League set at Avista Stadium. “He’s good,” manager Kenny Holmberg said of Crouse. “He’s even better with the starters that surround him. These guys compete the right way. They make each other better. Cruuse threw 51 of his 77 pitches for strikes, and both walks came in the fifth – his last inning of work. While his fastball was as advertised, he also showed off a sharp slider and effective changeup. It was Crouse’s second start of the season for the Indians (6-7). He was scheduled to pitch opening night but opened a cut on one of this fingers on his pitching hand during warmups and was scratched. He made his season debut on June 21 at Tri-City and lasted two innings. He allowed a run on one hit and three walks with two strikeouts. Crouse, who will turn 20 in September, was the Texas Rangers second-round draft pick in the 2017 MLB Draft out of Dana Hills High in Dana Point, California. The 6-foot-5, 200-pounder was committed to USC but accepted the Rangers’ offer of $1.45 million; his slot was valued at $926,000. Crouse’s first pitch was a knee-high 96 mph fastball to Connor Kopach, who eventually tapped back to Crouse for the first out. He went to a three-ball count to Seattle Mariners 2018 second-round pick Josh Stowers before battling back to get the outfielder looking on a fastball on the outside corner, then coaxed a medium-deep flyout by Ryne Ogren to end the inning. The offense then gave Crouse some breathing room. J.P. Martinez beat the pitcher covering on a bouncer to first, stole second and went to third on a ground out. He then scored on a medium-deep flyout to left. With two down, Diosbel Arias clobbered one over the fence at 365-foot mark in left center for his first homer of the season, and Curtis Terry followed with his third homer in as many days, a line drive with an exit velocity of 113 to straightaway left field. It was Terry’s sixth homer and 14th RBI of the season, both of which lead the NWL. The defending league home run champ has homered in six of his last seven games at home. Crouse gave up a hit without damage in the second, then retired the side in order in the third. Crouse is known for occasionally inserting a shimmy or wiggle in his delivery – sometimes as extreme as turning his back on the batter – and he exhibited that for the first time on a 1-2 pitch to Ronald Rosario in the third, in what could only be described as a slight pelvic thrust at the top of his windup. He struck out Rosario on the pitch. “Last year in the (Arizona League) I added a couple of new deliveries to my game, pelvic thrust being one of them,” Crouse said. “Just giving the hitter a different look, messing with his timing. In the fourth, Crouse got ahead of Stowers 0-2, and catcher Isaias Quiroz thought they had strike three on the inside corner. Someone in the Indians dugout apparently thought so too. Home plate umpire Andrew Clark turned toward the Indians dugout and tossed Holmberg immediately. Holmberg came out and proceeded to get his money’s worth, kicking dirt on home plate before eventually making his way down the tunnel. “He made a good pitch there,” Holmberg said. “That’s all I said. I’m going to fight for our guys. Stowers then looped a ball to center for a base hit, but Crouse came back to strike out the next two batters and Ryan Garcia flied to center to end the inning. Crouse got an ground out to start the fifth, then lost his release point and threw consecutive walks. He came back to strike out the ninth-place hitter then, after a visit by pitching coach Jono Armold, struck out Kopach on a changeup to end the threat. “Changeup is a pitch I’ve been working on all of extended spring training,” Crouse admitted. “Wanted to display that I had one to give hitters a different look there in the later innings. Everett (7-6) got on the board in the sixth against reliever Reggie Meyer. Stowers led off with a single and scored from first on Garcia’s double to the wall in left center. But Tyler Depreta-Johnson made a backhanded stab on a ball in the hole and threw out Charlie McConnell to end the inning. Obie Ricumstrict added some insurance in the seventh with a solo homer, his second of the season. The Indians loaded the bases in the eighth on a single and a pair of walks, then scored a run on a wild pitch. Transaction: After the game, a team official confirmed that Texas Rangers No. 17 prospect outfielder Miguel Aparicio was promoted to Low-A Hickory and outfielder Austin O’Banion was sent to the Indians. Published: June 27, 2018, 9:30 p.m. Updated: June 27, 2018, 10:59 p.m.